As some of you have noticed I recently I have put up two Voicethread posts about classroom activities. I am not sure why it surprised me, but tonight I spoke with a parent of one of my students and she loves the Voicethreads! A few commenters and other bloggers have noted that the Voicethreads are a nice way to show what goes on in intensive special needs classrooms and it registered with me, but more as a way to showcase to other teachers some things we are doing, not as a way to show parents what their sons and daughters have been up to in school. The parent shared that her sister actually viewed the Voicethread about snow before she did and could name the slides that involved her nephew, if only by his hands. How cool! 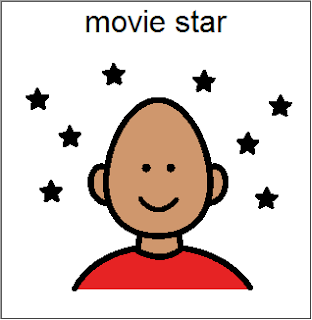 My student was able to be a star. Brothers and sisters of my students get to be online and in local papers all the time, for scouts, dancing, honor roll or sports awards. My students don't make it online or in the papers nearly as often (if ever). While I will never put my student's faces or names online as it is an invasion of privacy and dignity, even if I do have parental permission, just the "hands only" multimedia presentations are enough to give a taste of our daily experiences and make my students stars to their families. I would expect to see more of these on this site in the coming months! It's also very educational for parents and professionals to see - in visual detail - how you work in all the communication, literacy, alternative science etc. goals into one fun activity. Your 1/14/09 blog about music videos - where you list all the specific goals where music videos are utilized - was wonderful as well! I love your voice threads too and I think they are very useful to teachers. I used voicethread with my mild/moderate students as a format to present their research projects. Aside from narrations on the site they had to prepare notecards to introduce and summarize their information. It was amazing!